Most of the world’s population resides in regions where air quality contains life-threatening pollutants. An estimated 95 percent of people are breathing unhealthy air where ambient (outdoor) fine particulate matter concentrations (soot particles) surpass the World Health Organization’s Air Quality Guideline of 10 µg/m3, a new report has discovered. Almost 60 percent of the world’s population breathe unsafe air in areas where fine particulate matter exceeds a dangerous level of 35 µg/m3. The comprehensive study noticed most of the world’s hazardous air and the heaviest societal burdens are hitting impoverished communities the hardest. According to the State of Global Air project, a joint venture between the Health Effects Institute, the Institute for Health Metrics and Evaluation (IHME), and the University of British Columbia, fine particle air pollution is the most significant enviormental hazard worldwide. It is “responsible for a substantially larger number of attributable deaths than other more well-known behavioral risk factors such as alcohol use, physical inactivity, or high sodium intake,” said the report. Medium to long-term exposure to fine particle air pollution — contributed to an estimated 6.1 million deaths worldwide in 2016. 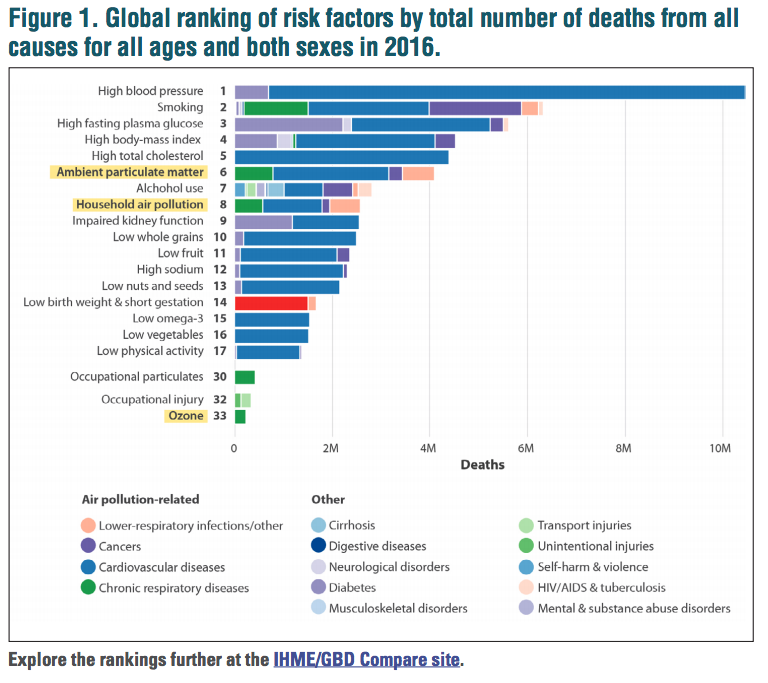 In the chart below, the report specifies that air pollution is the fourth-highest leading cause of death on a global scale, right after high blood pressure, smoking, obesity, and diet. Figure 1. Global ranking of risk factors by total number of deaths from all causes for all ages and both sexes in 2016. The report specifies 95 percent of the world’s population lives in regions exceeding WHO Air Quality Guidelines. Base on the data below, the highest concentrations of air pollution are in regions of Africa, Middle East, India, and much of Asia. 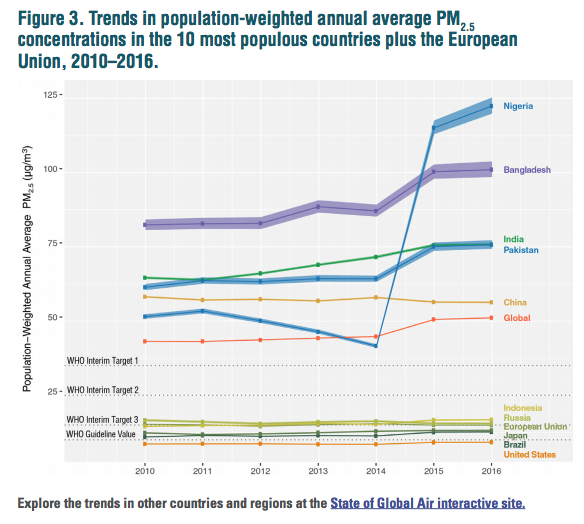 “The highest concentrations of population-weighted annual average PM2.5 (see “Defining Ambient Air Pollution” textbox) in 2016 were in countries in North Africa (e.g., Niger at 204 µg/m3 and Egypt at 126 µg/m3 ), West Africa (e.g., Cameroon at 140 µg/m3 and Nigeria at 122 µg/m3 ), and in the Middle East (e.g., Saudi Arabia at 188 µg/ m3 and Qatar at 148 µg/m3 ). The high outdoor concentrations in these regions were due mainly to windblown mineral dust. However, in some of these countries (Niger, Nigeria, and Cameroon), high proportions of the population burn solid fuels in the home and may also engage in open burning of agricultural lands or forests, both of which can also contribute substantially to outdoor air pollution. Figure 2. 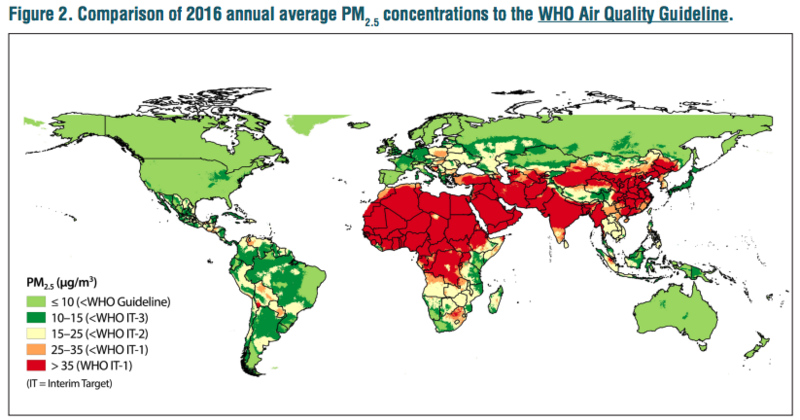 Comparison of 2016 annual average PM2.5 concentrations to the WHO Air Quality Guideline. “Air pollution takes a huge personal toll worldwide, making it difficult to breathe for those with respiratory disease, sending the young and old to hospital, missing school and work, and contributing to early death,” Bob O’Keefe, vice president of HEI, said in a statement. “The trends we report show real progress in some parts of the world — but serious challenges remain to eliminate this avoidable affliction,” he added. According to the report, China and India were both responsible for more than 50 percent of global deaths linked to air pollution. It also found that China’s air pollution has stabilized; meanwhile, Pakistan, Bangladesh, and India have experienced dramatic increases in air pollution since 2010. 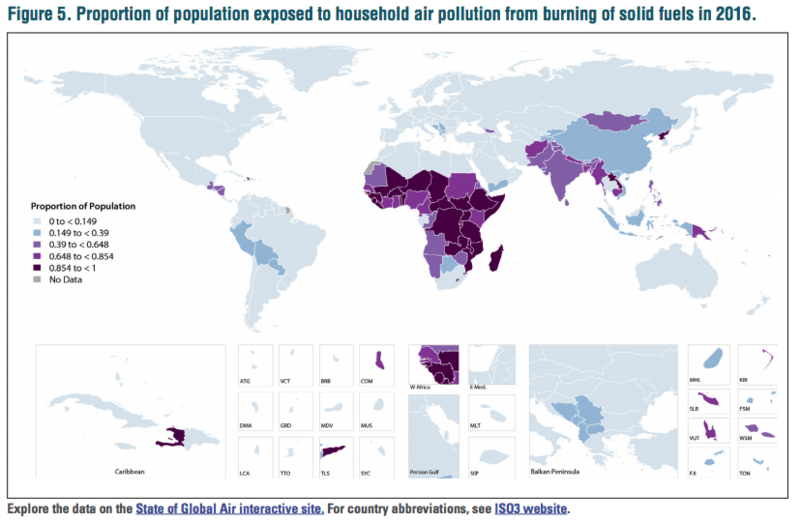 The report then dives into household air pollution from burning “solid fuels for cooking and heating is the 8th leading global risk factor contributing to disease burden.” Over 2.45 billion people — one in three global citizens — were exposed to harmful indoor air pollution from burning solid fuels in 2016. 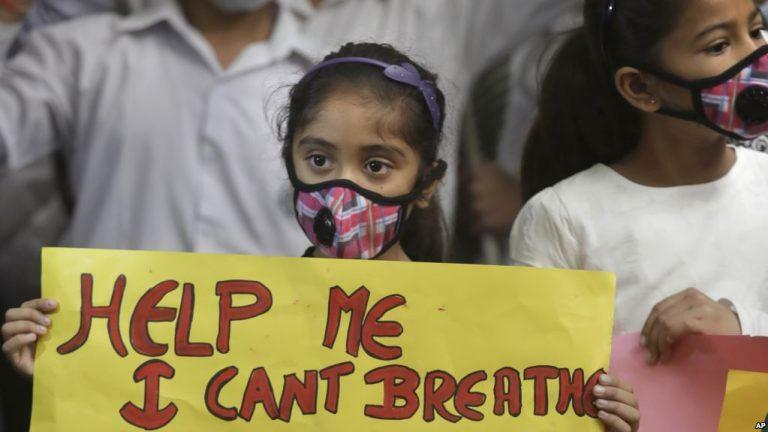 Shockingly, it contributed to one in four pollution deaths in India and one in five in China. Figure 5. Proportion of population exposed to household air pollution from burning of solid fuels in 2016. Figure 6. 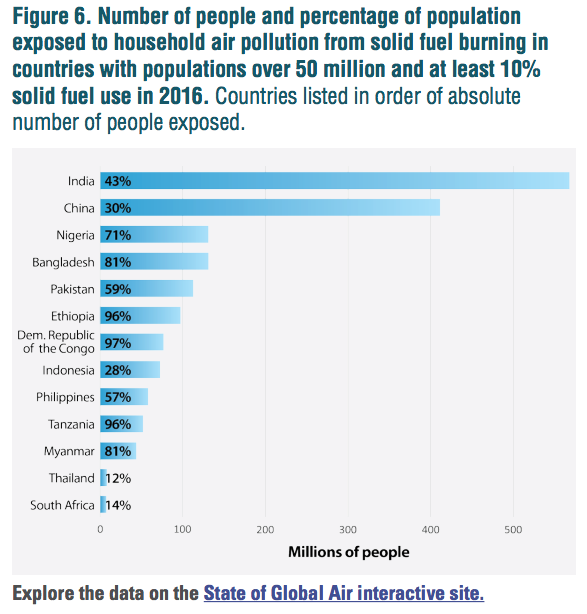 Number of people and percentage of population exposed to household air pollution from solid fuel burning in countries with populations over 50 million and at least 10% solid fuel use in 2016. Figure 7. 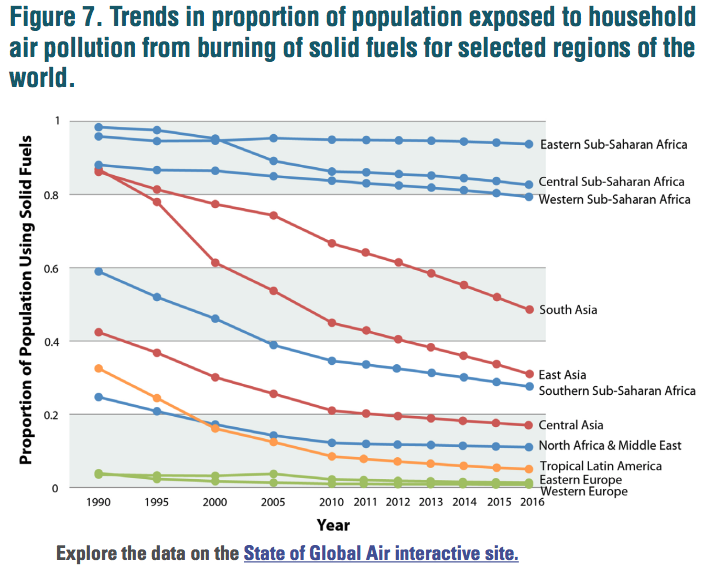 Trends in proportion of population exposed to household air pollution from burning of solid fuels for selected regions of the world. “The gap between the most polluted air on the planet and the least polluted was striking. While developed countries have made moves to clean up, many developing countries have fallen further behind while seeking economic growth,” O’Keefe said. Figure 9. 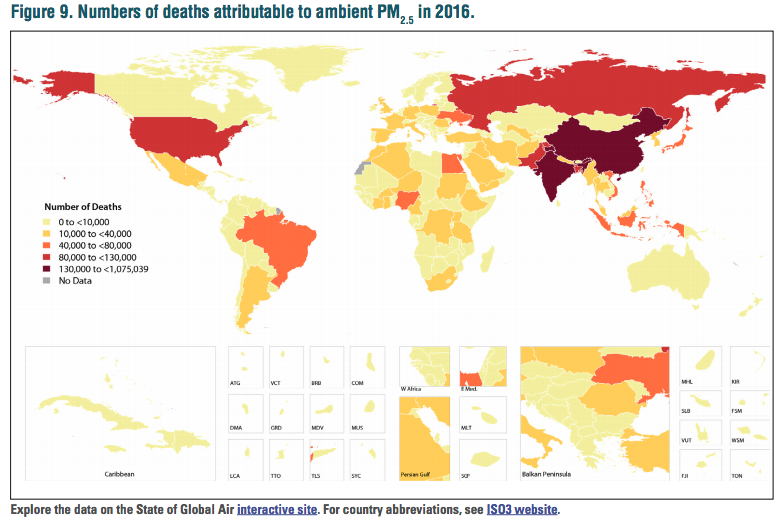 Numbers of deaths attributable to ambient PM2.5 in 2016. Figure 11. 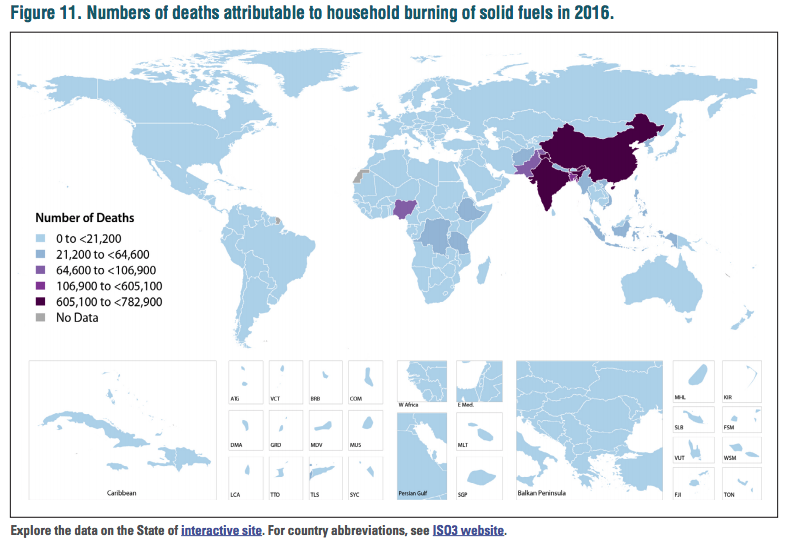 Numbers of deaths attributable to household burning of solid fuels in 2016. 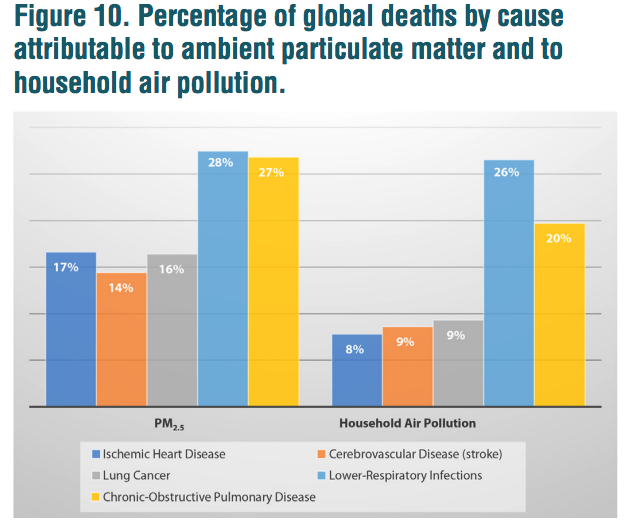 “The combined burden from both ambient and household air pollution falls most heavily on low and middle-income countries where exposures to both are high. These countries face a double burden,” stated the report. Figure 13. 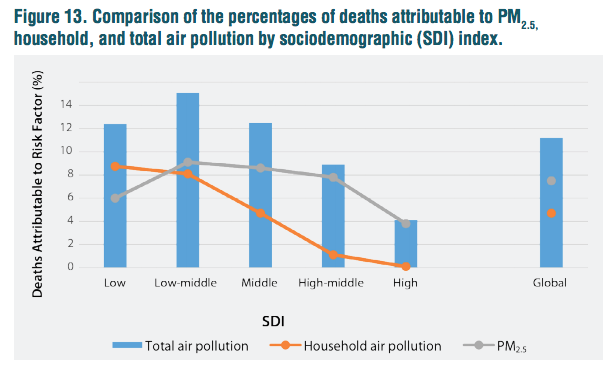 Comparison of the percentages of deaths attributable to PM2.5, household, and total air pollution by sociodemographic (SDI) index. Figure 14. 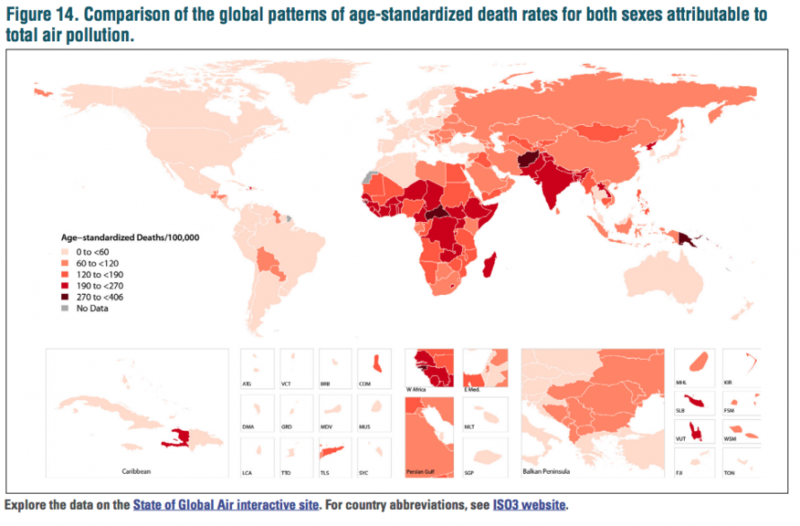 Comparison of the global patterns of age-standardized death rates for both sexes attributable to total air pollution.